Smith's Decorative Concrete Products| Nature Shield | Duval Paint & Decorating, Inc.
Smith's Nature Shield is a priming/penetrating water, oil and stain repellent developed to both mechanically and chemically bond to a wide variety of mineral substrates including, but not limited to concrete, stucco, pavers, natural stone, clay tile (Saltillo tile), and brick. This product is effective for applications where oil and stain resistance as well as water repellency is desired to reduce undesired stains, cracking, freeze / thaw damage, chemical degradation, biological growth, efflorescence and dirt pickup. 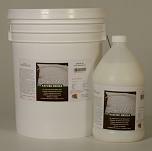 Nature Shield serves a primer (excellent intercoat adhesion) for various Smith's Decorative Concrete Products.